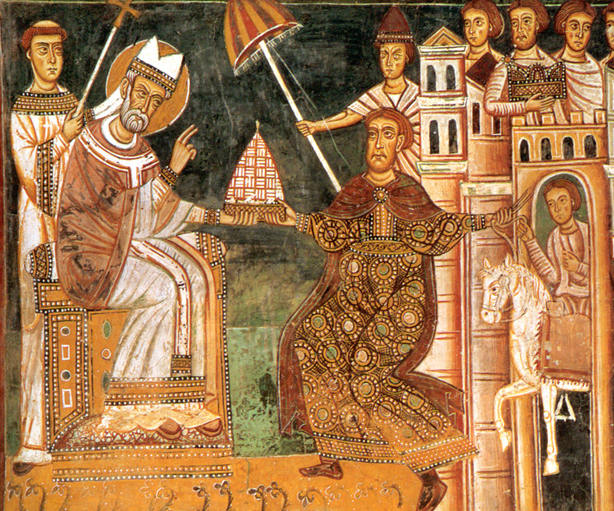 Donation of Constantine, Santi Quattro Coronati, Rome. My thesis deals with the relationship between the Papacy and the Byzantine Empire from the Sixth to the Eighth century. During this period, after the conquest of several regions of Italy by Justinian, the Papacy became a part of the Byzantine Empire. In this context, I study how the relationship between both offices took place and how it affected the institutional identity of the Papacy. First, I analyse the place of the Papacy in the Byzantine Empire: the position it occupied as head of an important ecclesiastical institution, which was at the same time a part of the Byzantine administration. I focus on the different ways of communication between Popes and Emperors: the exchange of letters and ambassadors, the representatives of both offices in Rome and Constantinople, the face-to-face encounters between members of both institutions. My main point is that the communication was not just a simple diplomatic relationship between two different sovereign states, but it was instead a political communication between different levels of authority within the same institutional system. Secondly, I concentrate on how this relationship modified the institutional identity of the Papacy. By institutional identity I mean the way in which the Papal institution was presented in ‘official’ – mostly juridical – sources (the imperial legislation, the acts of councils, some imperial and papal letters), and how this presentation influenced the manner in which Popes behaved and the ways in which others saw them. 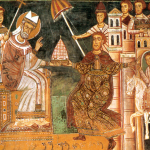 The relationship of the Papacy with the Emperor is not the only aspect we need to study to fully understand the changes of the institutional identity of the Papal institution, but it is without any doubt the most important the Papacy being a part of the Byzantine Empire and the Emperor being the undisputable leader of the Christian society. In order to do this, I take into account the full range of adjustments of the institutional identity of the Papacy to fit in the Byzantine Empire. This covers a range of adaptations, from the most powerful claims of Roman primacy (though never, in this age, as an independent institution from the imperial power), to the cohabitation and cooperation with all the Oriental patriarchates, including Constantinople. In this way, we will be allowed to escape the simplistic paradigm that analyses the history of the Papacy as the inexorable rise of an autonomous institution to the head of the Christian world.